Thopha saccata is a cicada found in Australia. It is also known as the Eastern Double Drummer. 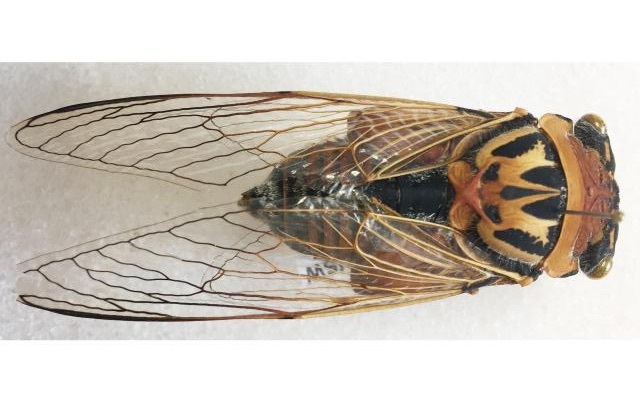 For more information about this cicada, visit A web guide to the cicadas of Australia by L. W. Popple. G is for Greengrocer. The Greengrocer is the green morph of the Australian cicada Cyclochila australasiae. These cicadas can be found in south-eastern Australia. They have a large pronotal collar, and if you use your imagination, it looks like they’re wearing a tiny Pith helmet above their eyes. Gaeana is a genus of cicadae found in Asia. Here are three Gaeana from Thailand: the black, gray, yellow and green Gaeana cheni, the brown, yellow and orange Gaeana festavor, and brown, white and green Gaeana festiva. Matija Gogala is a cicada researcher located in Ljubljana Slovenia. His Songs of Cicadas and Phantastic songs of the S.E. 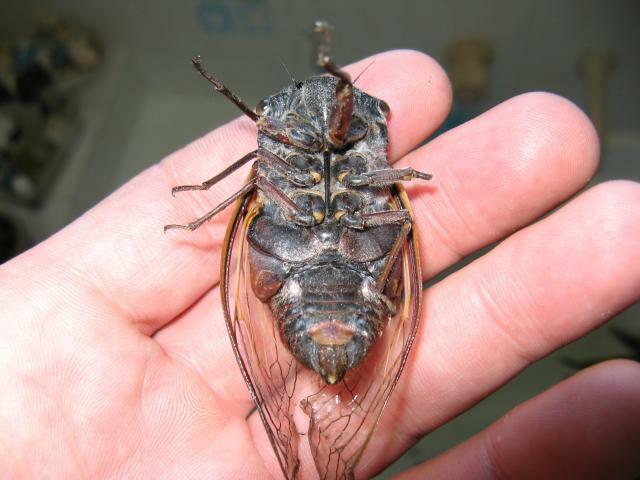 Asian cicadas! websites have been online since the 1990s. More Australian cicada photos from Kevin Lee. Quotes by Kevin. This is a double drummer who got stuck whilst emerging so he never got to fly and sing.. but he still saw the light of day and was in the room with the other cicadas and had a bit of company. But if I had left it on the tree he would have been eaten alive by ants. Amongst young Aussie kids the legendary White Knight is believed to exist but it is really just a black prince. When cicadas such as double drummers and black princes first emerge they appear white and gradually they develop their distinctive pigmentation. This is the before and after shots of the same cicada. See all of Kevin Lee’s cicada photos. I’m happy to announce that we received our first Australian cicada photos of this season!!! The photos were taken by Kevin Lee, Australia’s biggest cicada maniac. This is the season for cicadas and this year they are more proliferating that usual. Some would call it a plague but I love it. The birds (kookaburras and magpies) are having a feast! Cyclochila australasiae can be found in eastern Queensland, NSW and Victoria, and most emerge in October and November (Moulds, M.S.. Australian Cicadas Kennsignton: New South Wales Press, 1990, p. 61.). More: Previous posts about Australia’s cicadas. See all of Kevin’s cicada photos.